The dress is back button fastening and features an easy to knit 6 row lace pattern. 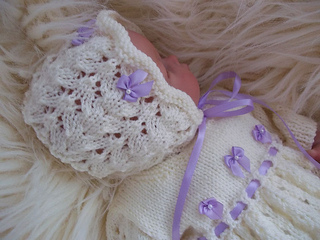 The smallest size requires 100g of 4ply yarn and the 0-3 Month Size approx 150g of Double Knitting. You will also require ribbon for the dress, bonnet and bootees and optional ribbon bow decorations.